This hearty one-dish skillet needs just a few ingredients and is ready in 30 minutes flat. With saucy chicken and STOVE TOP stuffing, how can you go wrong? Mix hot water, butter and stuffing mix. Cook chicken in large nonstick skillet sprayed with cooking spray on medium heat 5 min. on each side. Mix soup and sour cream until blended; pour over chicken. Top with stuffing; cover. Cook on low heat 10 min. or until chicken is done (165ºF). Serve with a bagged salad tossed with your favorite KRAFT Lite Dressing. Substitute fat-free milk for the sour cream. Heat oven to 375°F. Prepare stuffing as directed. 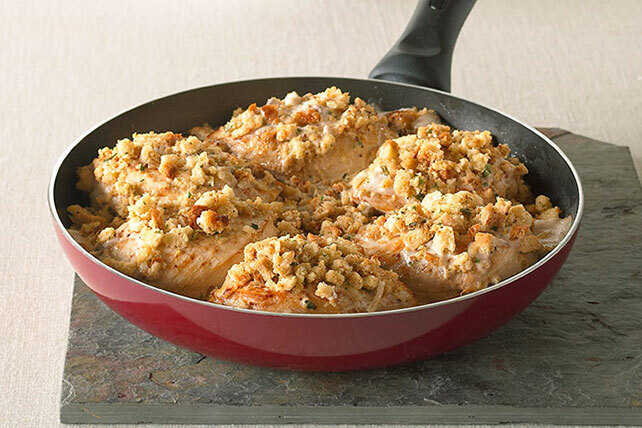 Place chicken in 13x9-inch baking dish or 2-qt. casserole sprayed with cooking spray. Mix soup and sour cream; pour over chicken. Top with stuffing. Bake 35 min. or until chicken is done.